of course I'm dying to see the kitchen cabinets but that will have to wait. 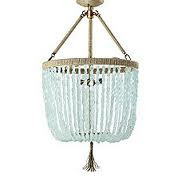 and a chandelier that I am dying to put in my master......( by Serena and Lilly) -RG- what do you think? ?